The rich have too much. Hiking the estate tax would be a powerful tool in a broader anti-inequality campaign. Forbes recently released the latest installment of its “Where Not to Die” guide, an annual public service to geriatric one-percenters. The magazine knows that millionaires, as maximizers of rational utility, commonly decide where to spend their golden years based on projections of how much of their money the government will seize once they’re no longer around to use it themselves. This year’s news is good for the millionaires and bad for everyone else. The guide helpfully includes a map that marks in bold colors all the oppressive states that impose an estate or inheritance tax, drawing particular attention to Maryland and New Jersey, which have both kinds. Eight states have decided to reduce or eliminate these taxes in the near future, and a similar proposal is now gaining ground in New Jersey, as the governor scrambles to impress tea partiers ahead of a possible presidential bid. Tennessee will wipe out its estate tax by 2016; five other states have done the same since 2010. Rhode Island’s exemption is rising to $1.5 million and Minnesota’s to $2 million, meaning a Minnesota resident who dies with $2.2 million will only be taxed on $200,000. New York, Maryland, Hawaii, and Delaware are all gradually raising their exemptions to match the federal level of $5.34 million. In Maryland’s case, this means only the top 0.14 percent of residents will pay the tax, costing about $122 million in annual revenue once it’s phased in. As it happens, these measures are daft economic policy, even from a Keynesian perspective. Rarely does anyone make major life decisions with the reductive motives in Mr. Webber’s fantasy, and serious academic research has repeatedly exposed tax flight as a myth. In fact, estate taxes have a positive correlation with the concentration of millionaires. Maryland and New Jersey have the highest concentration of millionaires in the US, and in both states that concentration has grown every year since 2009, despite the taxes. The states with the lowest percentage of millionaires, such as Mississippi and Arkansas, have no estate or inheritance taxes. But economic evidence makes little difference as long as neoliberal logic suffuses legislative discourse. As far as state leaders are concerned, it’s in their best interests to weaken and eliminate estate taxes, and that trend may well continue until the “Where Not to Die” list is superfluous. Meanwhile, the phantom of a solution has appeared in the US Senate, in the form of a bill filed by Vermont Sen. Bernie Sanders. The social democrat wants to impose a federal estate tax on multi-millionaires that would max out at 55 percent for the highest income bracket, and add a 10 percent surtax for estates worth more than $1 billion. The legislation would also close estate-tax loopholes and lower the tax exemption from $5.34 million to $3.5 million. It’s a phantom because, first of all, it has no chance of political success (a similar bill Sanders filed in 2010 was smirked at and forgotten), and second, while laudable, it doesn’t go nearly far enough. If the federal government taxed the estates of multimillionaires thoroughly enough, either with a levy of 95 percent or a hard cap on total inheritance disbursements, it could equally distribute a portion of that revenue to state governments, ending the states’ race to the bottom and helping reverse the polarization of wealth. This helps explain why taxes in the US do very little to ameliorate inequality, compared to the economic policies of many other rich countries, from the UK to the Slovak Republic to Japan. As for the hollow promise of equal opportunity, consider that almost half of Harvard’s students come from the top 3.8 percent of richest households, with incomes above $200,000. Moreover, excessive wealth has an inherent tendency to multiply. Bloomberg Businessweek reported in April that since Bill Gates has quit his job, sold most of his stock in Microsoft, and poured $28 billion into his nonprofit foundation, his total wealth has still increased from $63 billion to $79 billion in just the past two years. As a means of keeping inequality at bay, estate taxes are tested by time, dating back at least to the Egyptian Bronze Age. It’s traditionally been easier to tax a dead person’s estate than to track income on an annual basis. England has taxed inheritances since 1694, France since 1791. And in recent American history, heavy estate taxes have typically corresponded with the widespread dispersion of wealth. The government imposed one in 1916, partially to fund the war effort, but also because a tax vacuum in the late 1800s had made the top earners sixty times richer than the bottom 99 percent. 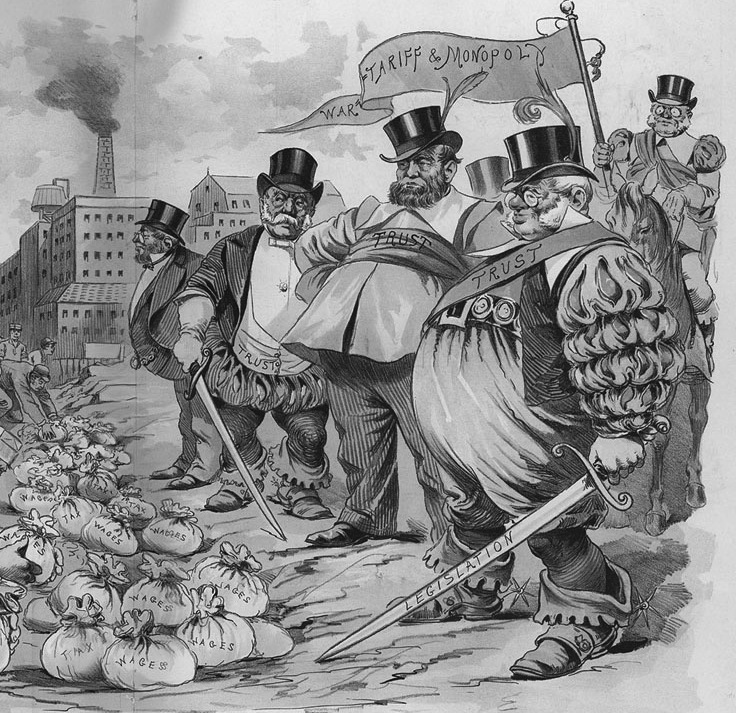 The estate tax was explicitly meant to seize their “swollen fortunes,” in Teddy Roosevelt’s words. It was also a way of making sure they paid taxes on capital gains, such as the appreciation of their art collections, which were never taxed in their lifetimes. Later, as the economy recovered from the Great Depression, Franklin Roosevelt upped the estate tax repeatedly, ultimately capping it at 77 percent. By 1949, 1 percenters were down to owning 22.5 percent of the nation’s wealth. Over the next quarter-century, median wages rose by 95 percent, with a robust estate tax in place all the while. Then in the 1970s, median wages and the estate tax started plummeting together. The estate tax fell in 1976, then again in the 1980s, and finally George W. Bush wiped it out completely. Since then Congress has raised it back up to 40 percent, with an exemption for the first $5.34 million. This isn’t to suggest that any estate tax, even one that wiped out inheritances altogether, could suffice as a solution to the income-disparity problem. As of 2011, inheritances only accounted for 14.7 percent of the one-percenters’ aggregate wealth; more often members of that rarified group amass their fortunes in the finance and tech industries. Estate taxes won’t cure a system where the great mass of citizens is driven into debt, and more important, this type of levy can’t expropriate obscene fortunes, or otherwise shift the balance of power, among the living. To solve these problems, we need both immediate remedies and structural changes. We could wipe out poverty and diminish the inordinate wealth of the rich with universal debt forgiveness, a better social welfare system, and a heavy tax on capital. We could equalize political power with an overhaul of our campaign-spending and lobbying policies. We could reduce privilege by restructuring our higher-education funding, and we could divert R&D spending from the military to our universities and public health. Effecting a shift in political discourse is also important. American politics has long suffered from an attachment to what the historian Richard Hofstadter called the “sanctity of private property.” In reality, private property is just a way of talking about social relationships. There’s nothing linking a man ontologically with his Cadillac; to say he owns it means he’s the only person who can drive it, sell it, or dismantle the engine without repercussions. The extent of those rights is always negotiated within a social context. Conservatives rarely sound goofier than when they call an estate tax a “death tax,” or a “tax on dying,” as though the deceased were having something taken away from them. Transferring property rights to the dead person’s blood relatives is an arbitrary convention. Hiking the estate tax would be a powerful tool in a broader anti-inequality campaign. And it would be an important symbolic gesture, affirming the importance of democracy and equality over private property rights. It’s time to soak the rich.